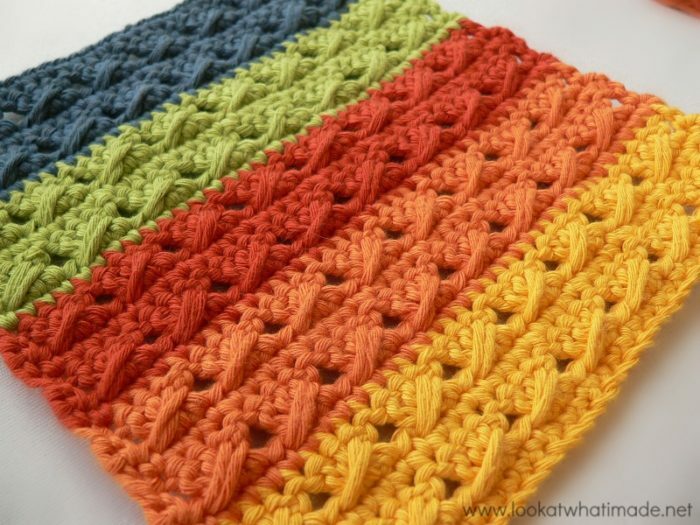 Yesterday I posted a photo tutorial for the crochet cable stitch, which has proven to be quite popular. 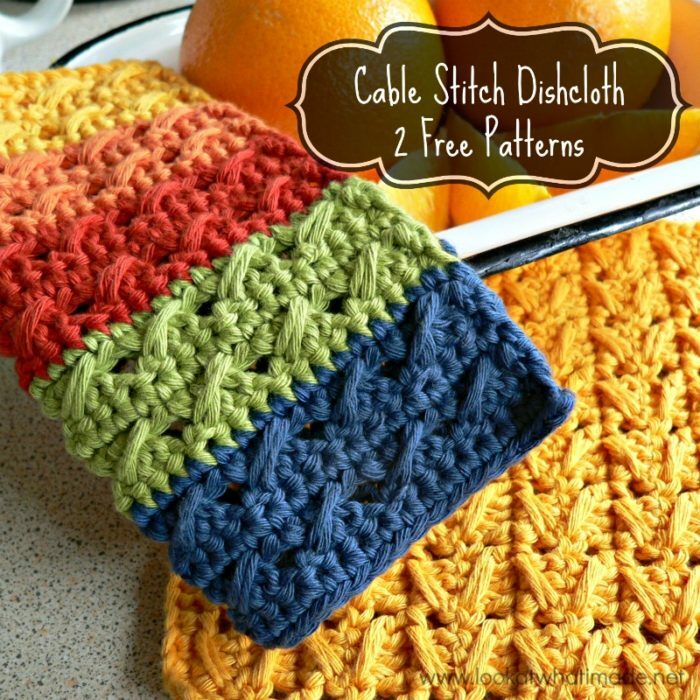 Today I am going to share two simple cable stitch dishcloth patterns with you. 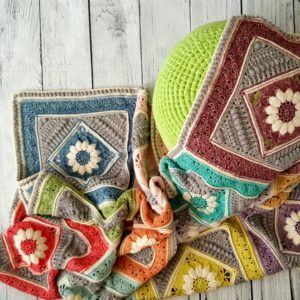 I love everything about the cable stitch. 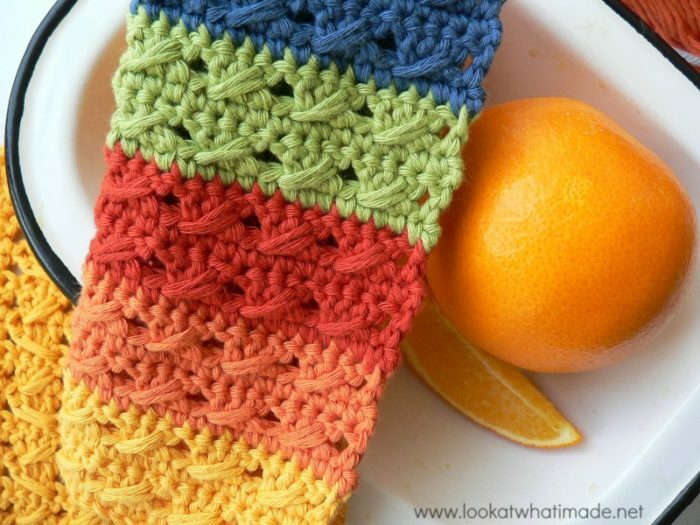 It works up quickly and it is a simple stitch to master. 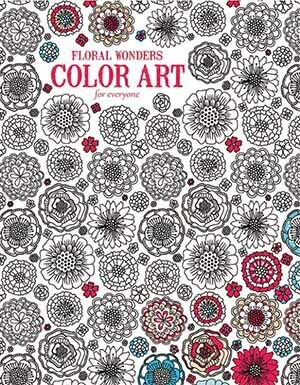 The result is textured, but delicate, and lends itself really well to lacy work. In a word, it is awesome! Below you will find both patterns, as well as a chart for each pattern. 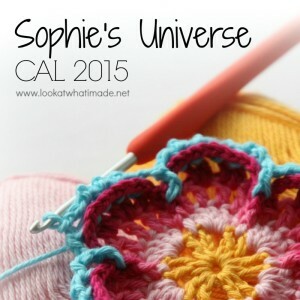 I hope you enjoy working with the cable stitch as much as I do! © Dedri Uys 2014. All Rights Reserved. 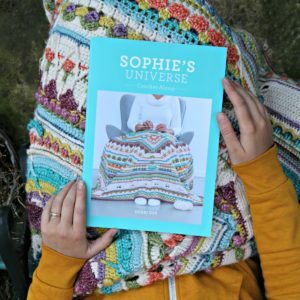 If you would like to print out the instructions for this pattern, please use the print-friendly button at the bottom of this post. 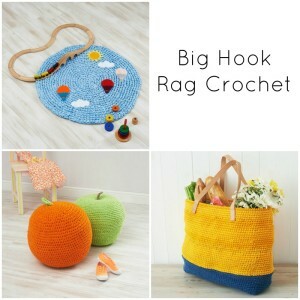 Your size depends on the crochet hook you choose to use and/or your gauge. If you would like a more dense cable stitch dishcloth, use a 4 mm crochet hook, which will yield a 6.5″ square dishcloth. 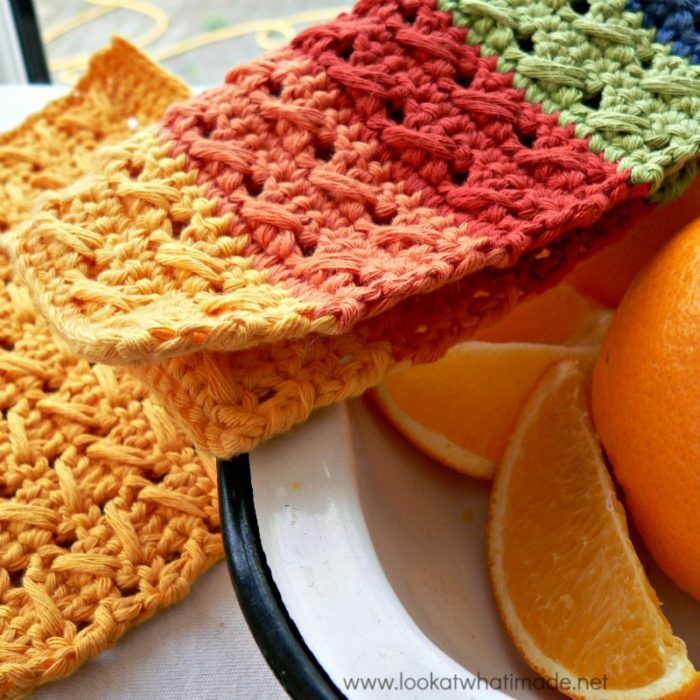 If you would like a slightly airier dishcloth, use a 5 mm crochet hook, which will yield a 8″ square dishcloth. US Terminology Used. See this comparitive chart for US/UK conversion. 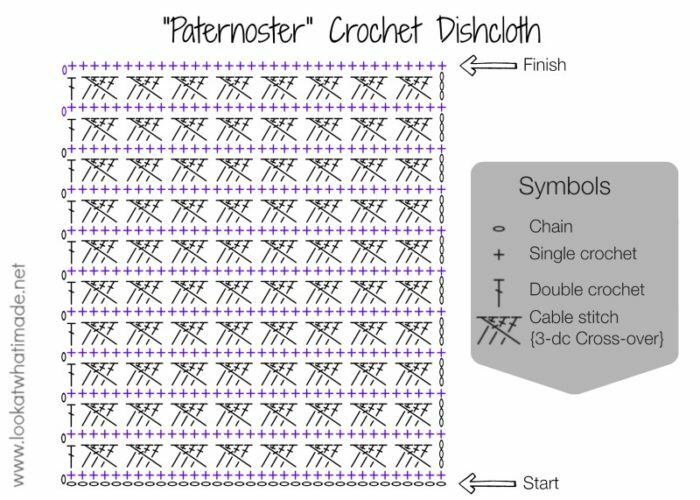 Cable stitch – Skip the next st. Dc in the next 3 st’s. 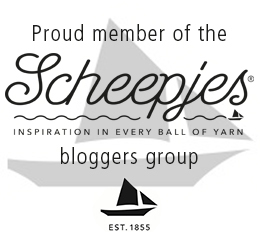 Working in front of the 3 dc’s, yarn over and insert your hook into the skipped stitch. Pull up a loop to the height of the dc’s. (Yarn over and pull through 2 loops) twice, completing an extended (or long) dc. See this photo tutorial if you need a little bit of visual help. When working cable stitch rows, the initial ch-3 will count as a stitch. When working INTO cable stitch rows, don’t forget to work into this ch-3 when you get to the end of the next row. When making sc rows, the initial ch st does NOT count as a stitch. In this version, the cables will slant in opposite directions in every row. Ch 35. Sc in the second chain from the hook and each of the remaining 33 ch’s and TURN. If you are going to use the same colour, ch 3 (this counts as your first dc) or start with a chainless double crochet. (Make a cable stitch over the next 4 st’s – see Special Stitches above) 8 times. Dc in the last st and TURN. Repeat Row 2, remembering that the beginning ch-3 of each row counts as a stitch. The 4 st’s that form each cable stitch should fall on top of the 4 st’s from the previous cable stitch. If your cables don’t line up, you have either started in the same stitch as the ch-3, not skipped a stitch when you should have, or skipped too many stitches. In this version, the cables will all slant in the same direction. This pattern reminds me of the day we went to Paternoster (in South Africa) with my parents-in-law and the choppy nature of the sea that day. 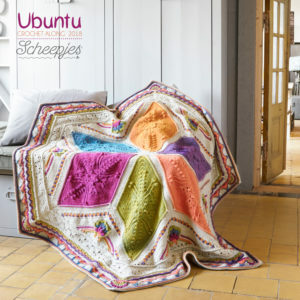 One of my crochet idols, Anneke Wiese from Crochet in Paternoster, lives there. 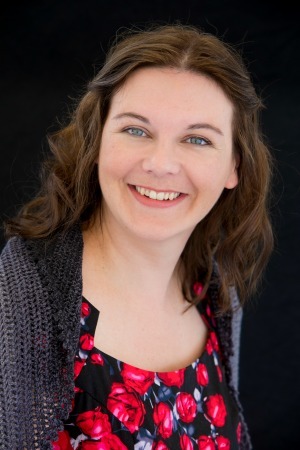 Just as an aside, Anneke has got a new pattern for a Twisted Neck Warmer (or Twistie, as it has become known) which is quick to work up and ridiculously popular. 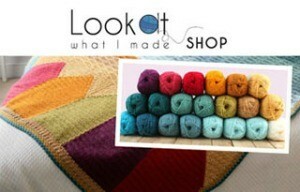 She also does some amazing t-shirt yarn rugs. Your last fact of the day is that Paternoster is Latin for “The Lord’s Prayer”, or “Die Onse Vader”, as I know it. Ch 1 and sc in the same stitch. Sc in the remaining 33 st’s across and TURN. Repeat Rows 2 and 3, remembering that the initial ch-3 of the cable stitch rows counts as a stitch. When you get to the end of Row 21, bind off and work away your tails of yarn. The 4 st’s that form each cable stitch should fall on top of the 4 st’s from the previous cable stitch 2 rows down. If your cables don’t line up, you have either started in the same stitch as the ch-3, not started in the same st as the ch-1, not skipped a stitch when you should have, or skipped too many stitches. And there you have it. 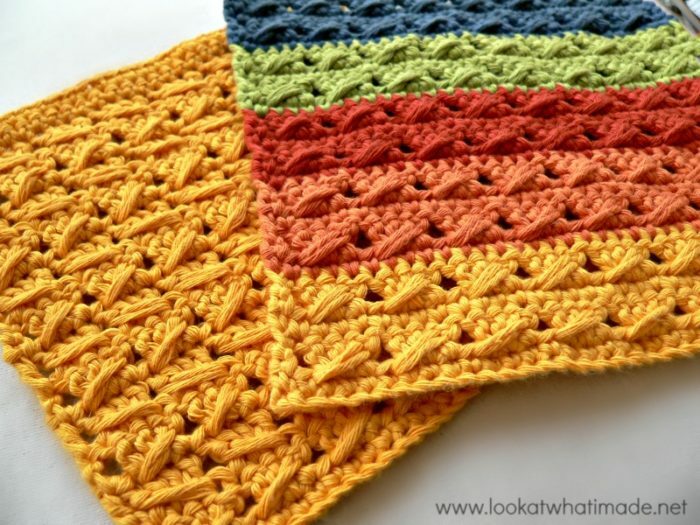 Two free crochet dishcloth patterns to help you practise (and fall in love with) the crochet cable stitch. 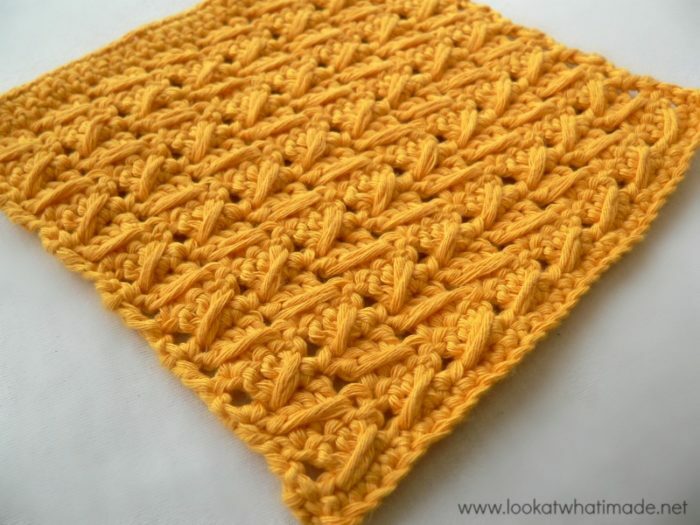 If you would like a more simple dishcloth pattern, why don’t you have a look at my linen stitch dishcloth. The linen stitch is probably the easiest of all the stitch patterns. You don’t even have to know how to work into stitches, just the spaces between stitches. I’d like to make mine a bit longer. So am I figuring it right if I do multiple of 4+2 but also +1? Since ur 35 chain is a skip 1 making it 34 usable stitches? I was wanting to add 2 more cables per row. Im almost there on figuring it but then get a tad confused when i think of your chain being 35 in leiu of 4+2. Hi Dianna. 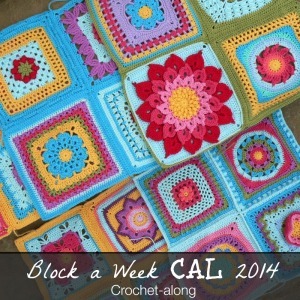 You are right that the starting chain should be a multiple of 4 + 3, giving you usable stitches of 4 + 2. 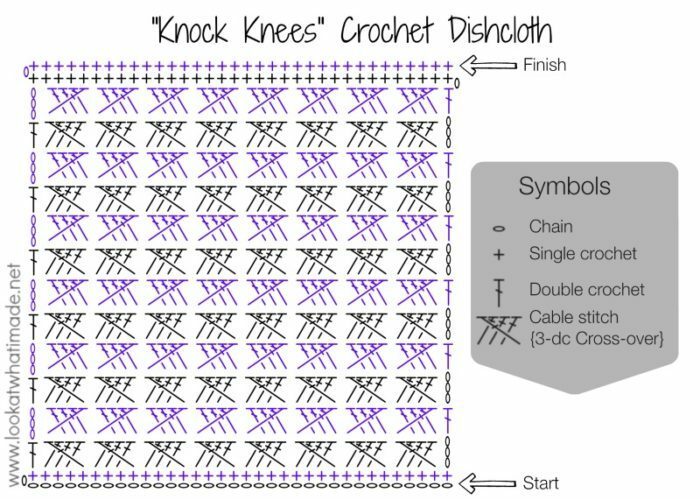 Starting with 43 chains will give you 42 stitches per row and 10 Cables per row. I understand what you mean about getting confused. Sometimes I literally have to chart things out in order for the maths to make sense to me. Have a great day! 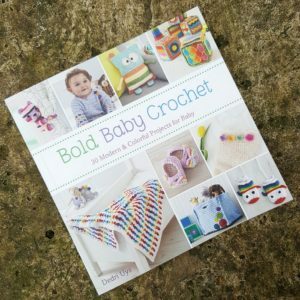 Thank you not only for some beautiful patterns but for introducing me to cable stitches and the chainless starting double crochet stitch! Feeling very accomplished tonight as I’ve learnt two new stitches. The chainless starting DC is going to revolutionise my crochet world!! 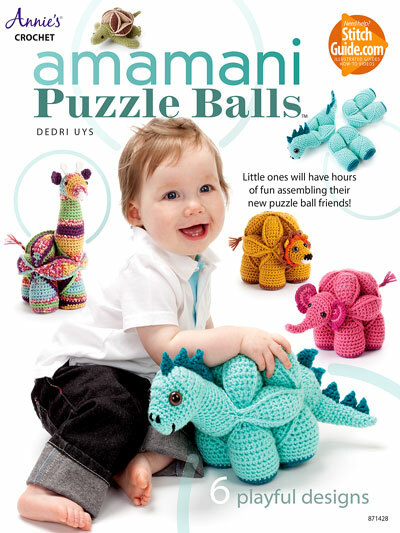 These look very interesting to make. Look forward to more. Love these! Especially the Paternoster dishcloth. Thank you for sharing!